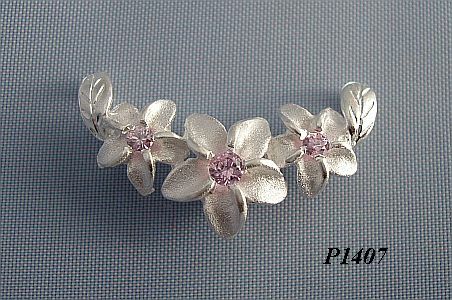 Sterling silver triple Hawaiian Plumeria (frangipani) jewelry pendant with frosted finish and features high polish petal edges and central eyes of pink ice cubic zirconia. Hand carved maile leaves hold the chain, there is also a chain holding link on the back centre of the pendant. Measurements: Central flower measures approx 12mm in diameter, 2 outer flowers 9mm. Total width 29mm. The ideal chain for this pendant is diamond cut rope chain, which is not included, it can be purchased separately as 40cm (16") Rope Chain or as 45cm (18") Rope Chain.